Stocks tumbled Tuesday after an unexpectedly sharp contraction in the U.S. services sector and a fresh downgrade in the financial sector. Within the first five minutes of trading, the Dow Jones Industrial Average was down about 150 points and just kept going. 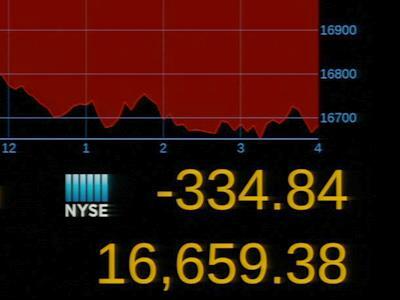 The S&P 500 index and the Nasdaq also declined. European shares continued to slide for a second day after a report that service-sector growth in the euro zone fell to a four-and-a-half-year low in January, fueling concerns that the U.S. slowdown may be spilling over into Europe. Spain in particular took a hit, recording the its slowest ever rate of growth in the service sector. “The sky is tumbling in on the Spanish services sector,” Bear Stearns analysts wrote in a note. Asian stocks also extended their losing streak amid global-recession fears. The Institute for Supply Management reported Tuesday that itsnonmanufacturing index, which measures the performance of the U.S. services sector, plunged to 41.9 from 54.4 in December. Economists had expected a more modest drop to 53. The services sector represents about 80 percent of U.S. economic activity, including businesses such as banks, airlines, hotels and restaurants. Goldman Sachs shares slipped after Oppenheimer downgraded the stock, citing valuation and other factors. On Monday, downgrades on credit-card providers such as American Express and a slew of other financials dragged down the market. Analysts are growing increasingly concerned that consumers are falling behind on their loan payments. In earnings news, oil giant BP reported that fourth-quarter replacement cost (RC), which strips out unrealized gains on fuel inventories, fell 24 percent to $2.97 billion. But BP’s shares gained 1.8 percent in premarket trading after the company said it favored returning money to shareholders via dividends, rather than share buybacks. The parent of the New York Stock Exchange, trans-Atlantic NYSE-Euronext , said its profit rose to $156 million, or 59 cents a share, compared with net income of $45 million, or 29 cents per share in the year-ago period — before the merger with Euronext. News Corp. , which closed a $5.6 billion deal to buy Wall Street Journal publisher Dow Jones in December, said quarterly profit rose just 1.2 percent to $832 million from $822 million a year earlier, in line with expectations. Power company Duke Energy posted earnings of 27 cents per share and beat analyst estimates. The company also provided an outlook for 2008 that was above expectations. Medical-device maker Boston Scientific posted a net loss of $458 million, or 31 cents a share, compared with a year-ago net profit of $277 million, or 19 cents a share. The net loss included acquisition, divestiture, litigation and restructuring-related charges and amortization expense (pre-tax) of $939 million, or 55 per share, the company said. Politics will take center stage on this Super Tuesday, as more than 20 states hold primaries for the presidential election. Analysts said the biggest challenge of the campaign will be the economy.